Rapid palatal expansion is a preliminary treatment procedure that aims at enlarging the maxillary dental arch and the palate (roof of the mouth) to re-establish balance between the width of the jaws. This procedure is also called “maxillary expansion”. Expansion is indicated when the upper jaw is too narrow compared to the lower jaw. This often causes an abnormal dental relationship and/or deviation of the lower jaw (see pictures). A jaw that is too narrow can often limit the airway located above the palate (nasal cavity) and expansion may sometimes help this condition. Palatal enlargement can facilitate the flow of air in the nasal cavity and allow the patient to breathe more easily through the nose. By widening the jaw, expansion may create more space to align crowded teeth. This procedure can be done at an early age because jaw width problems are visible early and will not be fixed with time. It is important to note that most of the time, a second phase of treatment will be necessary when all the permanent teeth have erupted to complete the corrections of the malocclusion. Expansion is not aimed at correcting dental malpositions but only harmonizing the width of the jaws instead. This can sometimes improve the position of the teeth but, sometimes, the position of the upper incisors may seem to be not as good after the expansion (to see examples). This will be fixed during a second phase of treatment. Ideally, expansion using an “expander” is performed at an early age (mixed dentition). Why correct a jaw that is too narrow? This can cause tooth wear and periodontium, as well as problems to temporomandibular joints. (A) 6-year-old boy with a narrow upper maxilla. When the mouth closes, the mandible is aligned with the upper jaw (blue arrow). (B) At the end of closing, interference between the right canines (circle) makes the mandible shift to the right in a crossbite. Rapid maxillary expansion will correct this shift. (A) At the end of the expansion treatment, the maxillary arch is “overcorrected”; there is a lot more expansion than necessary. The posterior segments are wider than the lower posterior teeth. The mandible now deviates to the left, which shows occlusal instability at that moment. This is more obvious with an upper occlusal view (B, arrows). This excess in expansion will disappear once the expander is removed. (C) 2 months after removing the appliance, the excess in expansion starts to decrease. (D) After 5 months, the maxillary arch width is normal, the crossbite is corrected, the midlines are aligned and the mandible is centered. (A and C) 7-year-old young patient with a posterior crossbite (arrow) caused by a narrow maxilla. This makes the mandible deviate to the right. (B) This deviation is visible when looking at the face; the chin is shifted to the right. 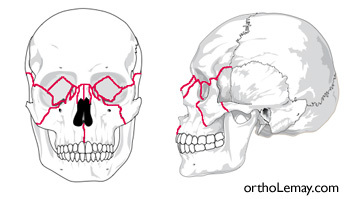 After expansion, the posterior crossbite is corrected (arrow), the maxillary arch is wider and the chin has shifted toward the middle, thus eliminating the asymmetry. Notice that there is still a significant space between the central incisors (diastema). This space can close a little in the following months, but a diastema will remain because this boy already had a significant space before expansion. ➡ To see other examples of mandibular deviation corrections following rapid palatal expansion, follow this link. What is an expander and how does it work? The expander is a custom-made orthodontic appliance which is bonded (cemented) to the posterior upper teeth and which allows enlargement of the palate. It includes a screw placed in the middle that can be turned to activate the appliance and generate a force that delicately separates the two palatal bones where the suture that unites them in the middle is located. The patient (or the parent) must perform 1 or 2 screw activations per day, never more, until desired enlargement is obtained. The activation period can last from 2 to ± 3 weeks and will result in activating the screw between 40 and more than 50 times. The patient is seen regularly (every 7-15 days) during the activation period. Once necessary expansion is obtained, activations of the screw are stopped and the appliance stays in place ±3 months to allow the bone tissue to form in the middle of the palate, in the suture that has been enlarged. (A) The first 3-4 turns of activation of the appliance will not produce visible changes, but still start to act on the suture. (B) After a few turns, the suture starts to open. A diastema (space) that appears between the upper central incisors confirms that the opening of the suture occurs normally. Activation is continued until the desired amount of expansion is obtained (± 3 weeks). (C) At the end of the activation period, the suture is maintained open by keeping the appliance in the mouth approximately 3 months without turning the screw. This immobilization period is necessary to allow remineralization of the opening zone of the suture. After this period, the expander can be removed. The space between the central incisors starts to close during immobilization. The opening of the suture is not visible in the mouth but it is visible on an X-ray. The X-rays below show a palate with an expander in place while the palatal suture opens during the rapid maxillary expansion phase. When the suture opens normally, a diastema (space) will appear between the upper central incisors. The red arrows indicate the opening zone of the palatal suture. The immobilization period (± 3 months) after the activation of the screw allows this area to undergo recalcification and form bone in the opening zone of the suture. It is possible to radiologically confirm that a maxillary suture is opening properly as shown on the examples below. Having to take such radiographs is however uncommon. (A) Before activation of the appliance; the expansion screw and the suture are closed. (B) Toward the end of expansion, the screw is open (blue arrows) and the suture is open by several millimetres. The red arrows indicate the dark zone which represents the opening of the suture. (C) Another case showing a very wide opening during maxillary expansion. The expansion screw was open by 14 mm and the dark zone of the suture is well visible. Front (anteroposterior) view, a radiograph clearly shows the opening of the palatal suture indicated by yellow arrows. A, B and C represent the same enlarged radiograph. The expansion screw, which reached its maximum opening, is also visible. The red arrow in (C) indicates the opening between the central incisors. (D) Occlusal radiograph where the opening of the suture is clearly visible. The darker areas on the radiographs are where the maxillary bones were separated. Note: Several variations in the design of expanders exist and each orthodontist has his own preferences. Certain appliances have more or less acrylic that covers the palate, they can have molar bands, acrylic that covers the posterior teeth, springs or extensions behind the anterior teeth, etc. Regardless of the kind of appliance used, they all have a screw in the middle that must be “turned” or activated and they are fixated permanently to the posterior teeth (until the end of the treatment) and the activation principles and the instructions below apply. Every type of fixed appliances can be efficient if they are used properly with known protocols. The activation is performed by inserting the special key that we have given you into the screw located in the middle of the expander and by turning the screw backward (toward the throat). Do not be afraid to insert the key all the way through the hole of the screw, the key has a stopper that will prevent it from being inserted too deeply. It is normal to see the child produce an exaggerated amount of saliva in the few hours following the insertion of the appliance. The mouth thinks that the appliance is food! This will disappear rapidly. This must generally be done twice per day; once in the morning and another time in the evening, unless we tell you otherwise. Never perform more than 2 turns per day. If you have to “skip” a turn for some reason, do not try to “make up for lost time” by doing more turns the following days. The total number of turns is more important than the rate (turns/day) at which they are made. We will see the patients ± two weeks after the expander is installed to verify that everything goes as planned, that the expansion progresses normally, etc. Afterward, and depending on the amount of expansion required, we will see the patients every two weeks until the total desired expansion is obtained. Once the expansion is obtained, we will stop turning the screw and will “immobilize” the appliance for a period of approximately three months (immobilization period) before removing it. It is preferable to make the turns before eating to minimize the discomfort sensation that can follow activation. Avoid activating the appliance right before going to bed. Ensure that you see the screw well. For the parents: when you activate the appliance, make the patient sit on a chair and make him/her tilt his/her head backward to get a better view. Good lighting is also essential. If you activate your own appliance, do so in front of a mirror. Ensure that you wrap the string of the key around your finger or wrist. This important precaution will prevent you from swallowing the key accidently. Insert the key in the hole in front of the screw. Then push the key delicately, but continuously, from the front to the back of the mouth. Remove the key at the end of the turn (toward the back of the mouth). A new hole will automatically appear in front of the screw when you push the key backward as far as possible. The screw is now ready for the next activation. The screw contains 4 different holes and each activation is equal to one-quarter turn. The upper jaw is generally wide enough in 15 or 20 days. However, the appliance must stay in the mouth for an immobilization period of ± 3 months to allow the formation of bone to fill up the space created by expansion. The appliance will thus remain in the mouth for a total of ± 4 months. How is an expander installed? Installing a fixed expander bonded to the teeth only takes a few minutes. To see how this appliance is installed, follow the link below. To see a video showing the installation of an expander. What happens during activation of the appliance? When you turn the screw, a sensation of pressure in the palate will occur. It is also possible to feel a tingling sensation in the nose and under the appliance. It is normal to feel a slight pressure in the palate and on the posterior teeth. The incisors can also become slightly sensitive. All of this is normal. This temporary discomfort should disappear after 15 or 30 minutes. It is also possible, in some patients, that teeth be sensitive for a few days. Expansion mainly occurs in the palatal suture but several other facial sutures may be indirectly affected by expansion (see red lines on the images on the opposite side) and cause various sensations which may vary from one person to another. Sometimes, a pressure sensation can also be felt in the sutures of nasal bones (near the forehead) and cheeks. This is normal but does not occur in all patients. If required, a mild pain killer (Advil, Motrin, etc.) will be able to relieve most of the discomforts, but for most patients, this procedure is not painful. If intense pain appears, this is not normal. Stop activating the appliance and communicate with us. If required, you can even try to “undo” a turn of the screw by activating the screw from the back to the front (opposing direction). In older patients (older than 16 years of age), the discomfort may remain. If this is the case, do not activate the appliance anymore and communicate with us. Never perform more than two turns of the screw per day. Stop activating the appliance when your orthodontist asks you so, even if you do not have an appointment on that day. You will notice that, as the palate widens, a space will appear between both upper central incisors. This temporary spacing is normal and will close naturally when activation of the appliance is finished. Carefully follow the activation schedule and the instructions that we have given you. A significant space will appear between the upper central incisors during expansion. This space will close within a few weeks. Sometimes, a tooth tilted inward, like this lateral incisor (*) will be corrected with the effect of expansion. The screw of an expander can be open by more than 1 cm to enlarge the palate. 8-year-old young girl with a posterior crossbite treated using rapid expansion. (A) The narrow upper jaw causes interferences between the teeth when the mouth closes (arrows), which make the lower jaw deviate to the right. The midlines (middle of the dental arches, in blue) are not aligned. (B) At the end of the expansion phase with the appliance in the mouth. 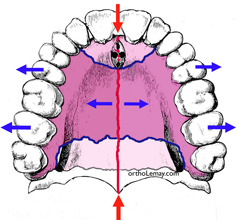 (C) Once the appliance is removed, the width of the maxillary arch is adequate and the mandible repositioned itself in the middle (aligned blue lines). Deviation of the jaw is no longer present. These temporary upper canines present a crossbite (tilted inward) but this is a dental problem rather than a skeletal one. Correcting this does not necessitate rapid palatal expansion. As described previously, it is normal to see a space (diastema) appear between the upper central incisors during rapid maxillary expansion. This is an indication that the palatal suture is opening and the treatment progresses well. The width of this space will vary depending on the number of turns of the screw performed, the rate at which activation of the screw is performed (number of turns/day) and the presence of a space between the central incisors before expansion. Expansion may necessitate between 40 and more than 50 turns of the screw. The more turns there are, the bigger the diastema will be. We recommend to perform 1-2 turns per day, never more. If turns are performed at a slower rate (for instance 1 turn every 2 days), the diastema will be smaller, because teeth may come back toward the middle as expansion occurs. If a space is present between the central incisors before the beginning of expansion, the final diastema will be bigger and can reach up to more than 10 mm. When activation is finished, the space will close progressively during a few weeks. It can close completely or almost completely if there were no space to begin with. If a space were present before expansion, a diastema will remain after the anterior teeth “return” to the middle. It will be equivalent in width to the initial space or sometimes slightly wider. This is normal and should not worry you. It is possible to close this residual space and any other space present between the upper incisors using fixed appliances while the expander is in the mouth, but after activation of the screw is finished. This may be indicated if the residual space is an esthetic problem or if there were any benefits to bringing the teeth “closer together” to help the eruption of the permanent canines that have not erupted yet and that have a problematic eruption path (visible on an X-ray). However, you must remember that expansion is only a preliminary step and it will have to be followed by additional corrections to correct the other aspects of the malocclusion. It is thus normal that several irregularities remain once this phase of the treatment is finished. (A) When a space (diastema) is already present before the beginning of rapid maxillary expansion, the opening of the space between the teeth will be more significant. Right posterior crossbite (arrows). (B) The initial space of 2.5 mm increased to 10 mm when the expander was immobilized. (C) Such a space will not close completely on its own, but it is possible to close it using fixed appliances. This correction can be performed while the expander is in the mouth once the activation turns are finished. (D) Result after the closing of the diastema, the removal of the appliances and the posterior relapse of the overcorrection. Will incisors return to their initial position? In the vast majority of cases, incisors that have been separated by the expansion process will reposition themselves similarly to the position they had prior to expansion. However, it is sometimes possible to see teeth, mostly the central incisors, have a different position after expansion. These teeth may have different vertical positions (a central incisor becomes slightly “longer” than the other one), be mesially tilted, show rotations (teeth that are turned) or even be more advanced or tilted forward. These movements are caused by the periodontal fibers in the gingiva that join teeth together. During expansion, these fibers are “stretched” and they tend to “loosen” or contract at the end of expansion. This thus acts like an elastic band on the teeth by pulling them one toward the other to bring them closer. This relapse movement does not always occur symmetrically, resulting in teeth that can move differently on one side or another, thus creating an asymmetric position of the teeth which is different than what it was initially. As described previously, if a space (diastema) between the central incisors were present before expansion, a space will remain after the expansion relapse and that space will be similar or slightly wider than the one at the beginning. If there were no space to begin with, there should not be any at the end of the relapse or a small one may remain. (A) Before expansion, the upper central incisors are straight. (B) At the end of expansion, a significant space will appear between the central incisors which are still straight (arrows). (The hygiene problem and dental plaque accumulation are to be noted.) (C) After a few months, the central incisors have relapsed mesially, but they also titled mesially, which may occur sometimes. This will be corrected during a subsequent step. Although such variation in the position of teeth may cause a small esthetic damage in some rare cases, this usually does not cause any functional problems. Let’s also remember that expansion being only a first phase of treatment, other corrections will be necessary later anyway to finalize and optimize the position of incisors and all the irregularities will thus be corrected. Moreover, it is possible that these teeth will move again when the permanent canines erupt. (A) 9-year-old young girl showing a bilateral posterior crossbite (arrows) caused by a significant constriction of the upper maxilla (B). (C and E) At the end of the expansion phase with the expander still in the mouth. (D) After the relapse of the overcorrection of expansion, the posterior teeth bite into a normal relationship (in width), but the upper central incisors have a different inclination. (F) Immediately following the removal of the expander; the palate shows redness and inflammation that will quickly disappear with a good oral hygiene. The yellow line has the same dimension as on image (B) and makes it possible to see the increase in the palatal width obtained. (A) Bilateral posterior crossbite (arrows) caused by a maxillary constriction in an 11.9-year-old girl. The upper central incisors are relatively parallel from one another. (B) After 4 weeks of activation of the rapid expansion appliance, the central incisors are not at the same level and are starting to tilt toward the midline. (C) One week later, when the expander is immobilized, the central incisors seem to upright slightly. (D) 2 years after the expansion, the permanent teeth have all erupted, but the central incisors are still tilted even if they came closer together a few weeks after the expansion ended. A second step of treatment will correct these dental malpositions. (A and B) Right posterior crossbite in a patient with mixed dentition (arrows). There is no space between the upper central incisors before the beginning of expansion. (C) Maxillary constriction causing the crossbite. (D and G) Expansion created a 8-mm diastema between the upper central incisors which is visible during immobilization of the expander. (G) This upper occlusal view shows the amount of overcorrection obtained. (E) After 3 months of immobilization and the removal of the appliance, the space has closed completely (black arrow). (F) Maxillary expansion is maintained when the permanent premolars and canines erupt. (A) Another example of a significant dental space present before the treatment. (B) After expansion, the diastema almost reaches 10 mm and will close partially afterwards. OPTICAL ILLUSION; These pictures show that it is hard to evaluate the amount of expansion obtained by only using pictures. (A) A front view does not seem to show a significant posterior expansion, but still, the screw was “open” by 11.5 mm! (B) An upper occlusal view makes it possible to appreciate that the posterior segments go past 100% the lower posterior teeth to the right and ~ 90% to the left (arrows), which confirms that a lot of expansion was obtained. Remember that “optical” phenomenon by looking at expansion cases! What is “overcorrection” during expansion? Overcorrection is the requirement to obtain a lot more expansion than what is ultimately necessary because we know that most part (up to more than 50%) of the gains obtained with the expander will be lost. The following image illustrates a transverse cut of the palate where a crossbite is present on the right side. (A) Unilateral posterior crossbite (blue circle on the patient’s right side). The opposite side can be normal (no crossbite) or could also present a crossbite (bilateral crossbite). (B) As expansion progresses, teeth are moved outward. Interference between the tips of the teeth may occur on the side where the crossbite was; the teeth will then momentarily fit in a tip-to-tip relationship (red circle). On the opposite side, teeth may separate vertically (absence of contact). The patient may then be under the impression that teeth only touch on one side. The interference may sometimes be adjusted by polishing the tips of the teeth if this causes discomfort to the patient. (C) At the end of expansion, overcorrection that makes the upper teeth “go over” the lower teeth is seen on each side (more on the side where there was no crossbite to begin with). This is normal and desirable. (D) Normally, after the relapse following the removal of the appliance, the overcorrection disappears and teeth touch normally after having returned partially toward the middle. The red line represents the initial palatal width and serves as a comparison to appreciate the enlargement of the palate. The blue line shows that the mandibular arch width is relatively stable compared to the maxillary arch. In fact, however, a little bit of expansion may occur in the mandibular arch that tends to follow the upper one. Ensure to clean the appliance well when you brush your teeth after each meal. A good hygiene will prevent accumulation of food debris and will avoid inflammation of the gum and palate. The regular use of a mouthwash containing fluoride is also recommended. There are no reasons not to use an electric toothbrush. The expander being quite voluminous, a certain adaptation is necessary to eat with this appliance, but it is possible! The appliance is solid and sturdy, so do not hesitate to chew on the parts that cover the teeth. At first, while you get used to it, you can be on a softer yet nutritive diet (soups, blenderized foods, omelets, ground beef, etc.). You will however be able to go back to a “normal” diet after a short time. It is possible that certain teeth, such as the incisors, become more sensitive and it will thus be harder to bite strongly with these teeth for some time. An expander is a quite bulky appliance that impinges on the available space for the tongue in the mouth. It is thus not abnormal to see phonetics being slightly affected immediately after the appliance is inserted. This should however return to normal after a few days in the vast majority of cases. Practice: to facilitate speech, the patient may practice himself/herself by reading out loud or exaggerate enunciation of sounds and words to “train” himself/herself with the appliance in the mouth. Learning will be very fast. What to do if problems arise? If you cannot insert the key in the hole of the screw, you probably have not completed the previous turn. To complete it, try to reinsert the key in the hole that is now at the back of the appliance (to do so, the key should be oriented toward the throat instead of the opening of the mouth). Complete the turn by pushing the key as far away backward as possible. Then, remove it while it faces the throat instead of bringing the key forward. A new hole should have appeared in front of the screw. Do not forget to always wrap the string around your wrist. If you feel pain in the jaw joints or any other symptoms that seem abnormal, let us know. It may be necessary to do certain minor adjustments to the appliance or to the posterior teeth. The expander must stay fixated to the teeth for a period of about 4 months. If you ever notice that the appliance moves or is debonded, stop the activation and communicate with our office. Activation of an expander in the mouth using the key. A special activation “key” that allows for a better grip on the rod that must be inserted in the hole of the expansion screw exists. This may be useful for patients who have a more limited opening of the mouth or if you have a hard time with a standard key. We will provide you with this key if necessary. (A) Activation key with a plastic “handle” (blue). (B) When the tip of the rod is inserted in the hole of the expansion screw and (C) during activation by pushing the handle backward to complete the one-quarter turn. As described previously, the goal of expansion is to re-establish the balance between the jaws rather than correct the individual position of teeth. So if there were “crooked” or malpositioned teeth before the expansion treatment, these teeth will have a similar position after expansion. Dental corrections will be performed in a subsequent step when the dentition is completed. However, in certain situations, it may be indicated to correct the position of the upper incisors on top of doing expansion. This may be the case when the incisors show a crossbite or a significant malposition (rotation, spacing, interference that shifts the jaw, etc.). (A) 8-year-old young girl showing a bilateral posterior AND anterior crossbite. A significant space (diastema) is present between the upper central incisors. (B) After the end of activation of the expander, brackets were put on the incisors to align them. The expander stays in the mouth. (C) After alignment of the incisors with the expander in the mouth. (D) When the expander and braces are removed, the teeth got closer and the crossbite is corrected. These preliminary corrections will have to be followed by more complete corrections (using braces) a few years later when the permanent dentition is completed, but this preliminary intervention re-established the balance between the jaws and eliminated a functional mandibular shift. If expansion is necessary in adulthood or after the palatal suture (in the middle of the palate) is fused, certain practicians recommend to perform a surgical intervention to help enlarge the palate using an expander. The surgery includes making an incision that weakens the maxillary bone and facilitates its enlargement where the suture is located. This procedure called SARPE (Surgically Assisted Rapid Palatal Expansion) aims at weakening the bone to allow it to “yield” when the expander applies a lateral pressure which will lead to separation of the palatal suture. Alternative: clinical protocols that allow palatal enlargement using “braces” that create slight expansion forces without using an expander or a surgical intervention now exist. In our practice, we no longer use SARPE. To see examples of cases treated with expansion but without an expander or SARPE. Maxillary expansion obtained without an expander or surgery in a young adult. The space where a damaged tooth had to be extracted (indicated by a *) was closed during the treatment. Can a narrow jaw enlarge with growth? The quick answer to this question is NO! The width of the jaw is the first of the 3 dimensions to stop growing, so if an arch is narrow at an early age, this problem will not be fixed with time or years even if growth is not finished. This residual growth will affect the other dimensions of the jaws and the posterior width of the arches where new teeth will erupt, but not where a crossbite is already present. The following cases, which did not undergo any orthodontic intervention, have the same width problem (crossbite) 3 years, 6 years and 20 years later, which demonstrates this point.. Example showing that crossbites do not “auto-correct” with time, years and growth. See below for more details on this case. (A) At 5 years of age, this boy showed a narrow upper maxilla. When he closes his mouth, an interference is present between the temporary right canines (blue circle). In this incomplete closing position, the midlines of both jaws are aligned (blue dotted lines). (B) When he closes his mouth completely, which is necessary to get the posterior teeth to touch and chew, the interference “forces” the mandible to shift to the right (white arrow), thus creating a right posterior crossbite (blue arrows) and a significant deviation of the midlines (blue lines). We refer to this type of crossbite as being functional because, even if the cause of the problem is a maxilla that is too narrow, the crossbite is visible when the function (closing) is used (functional crossbite). (C and D) 6 years later, that is at 11 years of age, the permanent teeth have started to erupt and, despite growth, the same maxillary constriction is still present with the posterior crossbite and the deviation of the midlines. This condition does not get fixed without orthodontic intervention. At what age can rapid maxillary expansion be performed? As discussed previously, the width of jaws is the first of the three dimensions (width, height and length) to stop growing and this occurs relatively early, even before the permanent teeth erupt. Thus, a jaw that is too narrow will stay that way unless an orthodontic intervention aiming at “widening” the upper maxilla is performed. The question then becomes at what age it is preferable to intervene if such intervention (any kind of expansion) will be necessary one day or another anyway. Opinions on the ideal period to perform rapid maxillary expansion vary. Although it is theoretically and technically possible to do this treatment at a very early age (for instance at 3, 4 or 5 years of age), the “limiting” factor at this age is a lot more the patient’s cooperation than the orthodontic indication to intervene. Most orthodontists will prefer to wait toward 6-7 years of age before intervening to be able to use the permanent first molars as anchor for the expander. At this later age, it is usually easier to take diagnostic material (study models, radiographs, pictures, etc. ), even if certain younger patients can do it very well. The severity of the problem (crossbite, mandibular deviation, etc.) can also influence the moment chosen by the orthodontist to intervene. However, it is relatively rare to see incapacitating crossbites at an early age to the point where it is impossible to wait toward 6-7 years of age to envision orthodontic corrections… but it is not impossible. In certain cases of sleep apnea affecting young children where there is no obstruction of the upper airways by tonsils and/or adenoids and a significant maxillary constriction is present, it can be justified to envision rapid maxillary expansion before 5-6 years of age. If the “motivation” to start such a treatment at a very early age (either it be from the parents or the orthodontist) is to avoid the need to have more elaborated global corrections afterward (braces, multiband appliances, etc. ), this will not happen (or very rarely; see example below) and everyone might end up being disappointed. So the question on the ideal age to perform rapid maxillary expansion should rather be “is it necessary to do it at this moment?” than “is it possible at a very early age?”. Is everything corrected after expansion? As described above, expansion aims at correcting an imbalance in width of the jaws rather than dental malpositions. However, widening a dental arch may sometimes have an effect on the position of teeth by providing additional space. In certain cases, this may allow the teeth to correct certain aspects of their malposition. In the vast majority of cases, maxillary expansion is only a preliminary step needed to be followed by additional corrections that aim at either correcting the other dimensions of the jaws (height and length) and/or dental malposition and irregularities. Most of the time, the preliminary interventions must be followed by a second corrective phase when the permanent (definitive) dentition is completed. (A) Malocclusion with a left posterior crossbite (arrows) caused by maxillary constriction. (B) At the end of expansion, with the appliance in the mouth. The diastema was created during expansion and will progressively close. (C) After more than one year and once the eruption of the permanent teeth is completed, the occlusion is functional and esthetically acceptable. No other corrections were performed. (D) Open mouth showing an alignment that is relatively acceptable despite a few irregularities. It may sometimes occur that a preliminary intervention, such as palatal expansion, be sufficient to obtain a functional and esthetic occlusion that does not require any other interventions when the patient is a teenager. This is what happened in the following example where a 9.4-year-old young boy had a right posterior crossbite accompanied by a mandibular shift on the same side. Maxillary expansion and a short treatment to align the incisors resulted in an acceptable occlusion. (A) 9.4-year-old boy – Posterior crossbite (yellow arrows) and mandibular shift to the right when the mouth closes. This is obvious by comparing the midlines (blue dotted lines). (C) Immobilization of the rapid maxillary expansion appliance at 9.5 years of age. (D) The use of a few orthodontic brackets to correct a persistent anterior crossbite and align the upper incisors. (E) These corrections only lasted for a few months. (F) 11.3 years of age – The correction of the incisors is maintained and we are waiting for the other permanent teeth to erupt. (B) When the permanent teeth have all erupted (13.5 years of age), the occlusion is esthetically and functionally acceptable and does not necessitate any other corrections. The midlines remain aligned. Let’s also note the improvement of the level of gingiva where the left lower incisor is located and which was slightly receding (blue arrows). Correcting the crossbite by these simple preliminary interventions prevented additional gingival loss with the years to come. As described earlier in this section, palatal expansion allows the enlargement of the upper jaw, improvement of the relationship between the jaws, improvement of the function, elimination of jaw deviations, etc. There are also several secondary benefits that cannot be obtained as directly or as predictably as palatal enlargement and the movement of teeth, but which may still occur frequently and result in significant benefits for patients. Mandibular deviations: maxillary expansion often makes it possible to get rid of a mandibular deviation caused by interferences between the teeth of opposing arches when the jaw closes. The expansion eliminates the interferences and very often allows the mandible to reposition itself in a position that is more centered (see the examples at the top of this page and below). The “repositioning” of the mandible can prevent growth from creating a permanent skeletal asymmetry, one that is a lot more difficult to correct later on (and that can necessitate a surgery) and minimize the risks of premature and abnormal tooth wear. Mouth breathing: several patients having undergone palatal expansion report having an easier time breathing through the nose, saw their snoring decrease or improvement of their allergies. Even though these cases are anecdotal and the goal of expansion is not obtaining these positive secondary effects, they occur from time to time. The example below is of a 7-year-old young boy who suffered from sleep apnea at an early age. His tonsils and adenoids were removed, which eliminated sleep apnea. He also suffered from several ear infections mainly during winter (up to 8 episodes). After undergoing maxillary expansion, he did not suffer from ear infections afterwards. It is hard to explain the relationship between these elements, but these benefits sometimes occur. This 7-year-old young patient who shows maxillary constriction suffered from several ear infections each winter. After palatal expansion, he did no longer suffer from ear infections. (A) Narrow maxilla in a 9-year-old boy who suffers from chronic snoring. (B) View of the upper jaw that is too narrow compared to the mandible. Although there are no “guarantees”, maxillary expansion often decreases snoring problems in children. (A, B) Interference between the temporary canines that makes the mandible deviate to the right in a crossbite when it closes (B) in a 5-year-old boy. (C, D) Without any orthodontic intervention, the same condition remains 5 years later at 11 years of age. Growth is insufficient to correct such a problem. The upper right teeth are still tipped inward (arrows in B, D, E and F). (G, H) The maxillary expansion will have made it possible to re-establish the balance between the width of the jaws and correct the mandibular deviation. Rapid maxillary expansion is an orthopedic movement that mainly puts a strain on the maxillary suture (but other sutures are also affected), the maxillary bones, the teeth and the periodontium. Particular care must be taken for the gum (width and thickness) when expansion (regardless of the method used) is planned. Adults show more gingival recession problems and expansion may have a negative effect on the gum and the periodontium if it is not planned or executed properly. To know more on gingival recession during orthodontics. This 18-year-old young man, who will start an orthodontic treatment to correct his malocclusion, shows a V-shaped maxillary arch that is very narrow (D) and a bilateral posterior crossbite. (A, B, C) Even if his gums are generally of good quality (width and thickness of tissues), even before the beginning of treatment, several teeth (indicated by the arrows) have different degrees of recession. The maxillary arch having to be enlarged, the level of gingiva will have to be monitored closely during the orthodontic treatment. If it diminishes significantly, gingival grafts or similar procedures may be necessary. The patient will have to pay particular attention to his oral hygiene and his brushing technique during the treatment to avoid contributing even more to gingival loss. A maxillary deficiency affects more often the maxilla in the width dimension (narrowness), but there may also be an anteroposterior imbalance (in length). The treatment of such malocclusions necessitates a particular approach using an extraoral face mask. Installing an expander is relatively simple. This appliance is simply bonded to a part of the surface of the posterior teeth using the same composite as the one used to make “white” dental restorations (“white fillings”). The surface of the teeth where the appliance will be installed is first cleaned. Then, retractors are used to keep the lips and the cheeks away from the dental surfaces while teeth are dried out and a special product is applied for 15-20 seconds to make the dental enamel more porous to retain the adhesive (etching) that will be applied. The teeth are then rinsed and dried out again and are now ready for the expander. Adhesive is put on the appliance only where it will be in contact with the surface of the teeth. It is then positioned on the surface of the teeth and a special polymerization light is used to harden the adhesive in 15-20 seconds. No anesthesia, injection, surgery, etc. is necessary and installing the appliance is done in only a few minutes. Once expansion is completed, the adhesive is easily broken with special pliers and the appliance is removed in a few seconds. If adhesive remains on the teeth, it is removed and the surface of the teeth is cleaned and there you go, that’s all there is to it! To learn about the steps and see videos illustrating how a rapid expansion appliance is installed and removed, follow this link. Steps of the installation of a rapid maxillary expansion appliance. To learn more and see a video, follow the link above. If I am 30 years old will the expander be efficient at my age? A rapid palatal expander is usually not recommended in adults unless a surgical adjunct procedure is also done (SARME).